Joe Pagac, a native Tucsonan, has been painting murals in Tucson for 14 years and has painted some of the Old Pueblo’s most famous murals. After studying and traveling the world, Pagac still takes his inspiration from the Sonoran Desert but enjoys keeping his art a little surreal and whimsical. “When you’re a muralist, every wall is a good spot for a mural,” Pagac said. 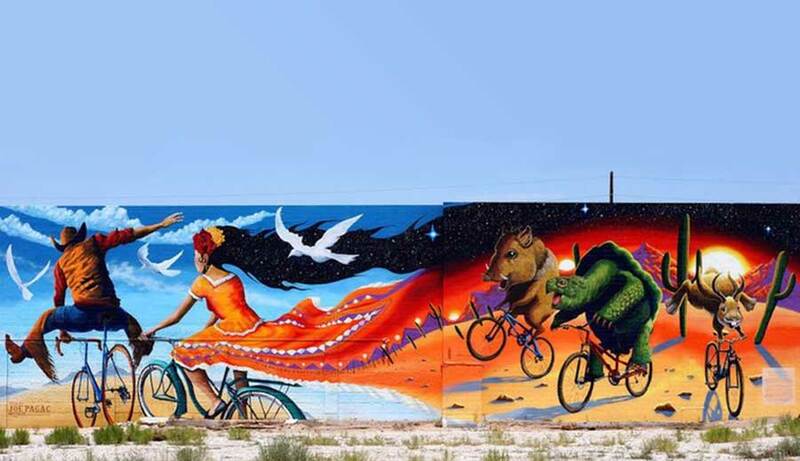 Epic Rides, one of Pagac’s most famous Tucson murals, features desert critters and a woman riding a bike, whose dress flows into a crimson and apricot colored desert, while her dark hair absorbs into the night sky. Epic Rides was fully funded by the Tucson community through a Kickstarter campaign that raised $21,616 from 302 Tucsonans in 24 days—well over Pagac’s $18,000 goal. While there are many rewards of painting a giant mural that will greet visitors and offer a warm hello to locals, Pagac said it’s the sense of fulfillment that stands out the most. Daily phone calls from strangers keep Pagac’s passion for art going. Pagac said it’s a good feeling to know he’s making a difference with every mural. Because Tucson’s summers can put a strain on painting, Pagac said he most often paints overnight. “It’s brutally hot otherwise,” he said. So much of the Old Pueblo’s culture is hidden behind doors because of the sizzling summer weather, but for Pagac, the murals around the Old Pueblo have added surface culture to the community. “It really helps brighten the city and show off how vibrant our culture is here, especially to an outsider and people just cruising around,” Pagac said. Pagac continues paint murals around Tucson, most recently working on a variety of pieces at the Hotel McCoy, and hopes to continue brightening the streets of Tucson. © 2019 Tucson Guide. All Rights Reserved.